Welcome to the third post in our series featuring some of the tools, resources and programs available in the mainstream workforce system, shaped by the Workforce Innovation and Opportunity Act (WIOA) and delivered through the national network of American Job Centers serving all U.S. job seekers. It’s a complex, resource-rich system underutilized in refugee employment services. Higher is determined to change that so our clients benefit from new opportunities and employment services. We’ll do the research you don’t have time for amidst managing client caseloads and employer relationships. You can focus on using highlighted resources to help your clients succeed in the U.S. workforce. In our first two posts we highlighted online tools that you can utilize in your job counseling and job development efforts. In the next few posts we want to shift to highlighting programs within the mainstream workforce system that can help your clients break into career fields that they are interested in. Breaking into one’s field of choice can be a challenge, even for native-born Americans. On-the-job Training (OJT) is funded through the Workforce Innovation and Opportunity Act (WIOA), and is one strategy for obtaining or updating skills and securing employment. OJT is a win-win situation in which the OJT participant receives training and employment and the employer is reimbursed for the training costs (usually calculated at half the pay rate for the agreed-upon training period- although under the new WIOA legislation states can choose to increase employer reimbursement up to 75%). For refugees, OJT can be a strategic way to either re-enter one’s former industry or gain new skills that will put them on a stable career path in the US. Because OJT is a comprehensive skills training program, it will be most useful for refugees with higher levels of English and literacy. Some programs, however, have found success placing LEP clients in OJT placements when there is a strong relationship between the employer and the refugee employment program in which they work as a team to make sure the OJT training is successful. From the research Higher has done so far, refugees with backgrounds in “blue-collar” industries (e.g. construction, manufacturing) seem to be a particularly good fit for OJT, because of the experience they bring to the table, and because the federal reimbursement opportunity is attractive to small and medium sized business in these fields. That being said, there have also been successful OJT placements with both high skilled refugees with more professional backgrounds and low-skilled refugees with little to no work background (see examples below). Commit to learning the system: If you don’t already have someone on staff who has a background in mainstream workforce development, identify someone who can commit the time to learning the process and be the liaison between your office and the American Job Center (AJC). Additionally, look for allies within the mainstream system who are excited about your work and can give you an insider’s perspective on how to navigate the system. Strong job development makes strong OJT placements: Often times it’s the employers you already have strong relationships with who will be most interested in placing your clients in OJT. You can also use OJT as a selling point when approaching new employers. Either way, you can put the opportunity on their radar and if they’re interested, you can can make the connection to the AJC to continue the process. Provide good marketing materials for employers: In the same way that you provide employers good information about refugees, consider also leaving them with a nice brochure about OJT. Give them something to think about, and follow up with them shortly afterwards. Offer employers additional support (coordinating interpretation, etc. ): Let them know that you not only can provide them with strong candidates, but you are available to provide reasonable support to them to help with some of the challenges that come along with hiring refugees. Make the right match: Always remember to take your clients past experience and skills into account when recommending them for OJT. While OJT may at times provide an opportunity for someone to learn completely new skills, the OJT program is primarily designed to be a skills upgrade program, and trainees are expected to begin contributing as productive workers on day one. The refugee programs that have found success with OJT have done so largely because they capitalized on skills their clients already had. If OJT is new for you, the best place to get started would be to contact your local American Job Center (AJC). Click here to find an AJC near you. Once you identify the OJT resources and process in your community, you can begin marketing the program to employers that you work with. The Employment Training Administration (ETA) is in the process of updating its’ OJT Toolkit which will be made available soon on the new Workforce GPS website, but in the meantime click here to access a recent webinar entitled “Strategies for Implementing OJT Simply and Effectively” as well as an OJT Training Brief and Resource Guide by the same name (you can find it in the left hand column called “Related Resources”). Also, keep your eyes out in the next month or so for the next edition of our Workforce Collaboration Case Study Series, which will take a deeper look at the OJT partnership (highlighted briefly in this post) between Lutheran Family Services and Goodwill Industries in Omaha, NE. Have You Placed Clients in OJT? It’s impossible for us to know everything that everyone is doing out there. If you’ve placed clients in OJT, please let us know so that we can learn from your experiences as we continue to look at this strategy for refugee employment! Send us an email at information@higheradvantage.org. With such limited time and capacity, you’ve got to make the most out of the time you have for Job Development. 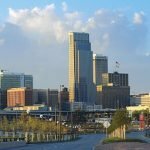 Back in February, we highlighted some online industry research tools available on www.careeronestop.org that can help Job Developers be strategic about what industries they pursue by looking at local labor market information such as fastest growing occupations, most total job openings and occupations with the largest employment. We’ve recently come across a similar (though less extensive) resource that also presents labor market information, but in a format that is much more user-friendly and more visually appealing. Where-are-the-jobs.com provides a “graphic representation of occupation employment statistics.” The website was developed by SymSoft Solutions using open data provided by the U.S. Department of Labor’s Bureau of Labor Statistics and U.S. Census Bureau, and provides insights on employment trends and salary information for various occupations. We hope that this tool as well as the resources available at careeronestop.org will increase your ability to use your time wisely and strategically identify the best opportunities for your clients. If you have any stories about how you’ve used data-driven strategies to drive your job development efforts we’d love to hear them. Share your story by emailing us at information@higheradvantage.org or by using the comments section below. Although archives from a recent LINCS’ Working with Immigrant Professionals webinar are not yet available, Kelly Rice, Employment Program Manager at the International Center of Kentucky in Bowling Green heard some valuable new ideas and quickly did two things to follow-up. She started a Skilled Immigrant and Refugee Resources Working Group on Linkedin that you are welcomed to join. She also conbuted this blog post with her take on working with highly skilled refugees. A job developer’s job is never finished. We are always seeking the best opportunities for our clients, but sometimes they need to get a job quick – what do we do? Usually, they are placed into an entry-level position until they can find that job upgrade. Many highly skilled or professionally licensed clients are placed in first jobs jobs for which they are over qualified. How do we make it easier for them to find a career path in the same field they pursued before being resettled in the U.S.? “Do they speak English” is the question I am asked most often by employers. Advanced English classes with contextualized content (possibly online?). Integrate English learning with test-taking strategies to assist participants’ career pursuits. Employers use social media, A LOT. Mentorship program with career professionals. Workshops and peer support groups. Professional associations, Linkedin.com, meetup.com, Facebook, Twitter. Added benefits in professional understanding and increased confidence levels. Mock interviews and feedback sessions (utilizing employer volunteers?). Individual career coaching – use employment mentors who are career professionals. GED Programs, Small Business Entrepreneurship Programs or Economic Empowerment Programs are valuable resources. Computer classes are usually available at libraries and career centers. Public Libraries, Community Colleges, Private Language Institutes are key resources. Resume vs CV, Cover Letter, References. Professional Portfolio (showcase their work, projects, articles). Enables educated immigrants and refugees to gain recognition of their credentials and access to opportunities. Helps licensing boards, employers, academic institutions understand qualifications earned outside the U.S. Larger employers and licensing boards usually have formal processes and/or have a preferred credential evaluation service. Know which one is required before spending any money. Many employers are unfamiliar with credential evaluation or skeptical of foreign qualifications – help employers understand the process. Refugees need to proactively “market” their evaluation and highlight their US equivalencies to overcome employer concerns. Non-licensed teachers can work in as teachers in private schools, instructors at community colleges, adult education instructors, corporate trainers, etc. Teachers also have opportunities for alternate routes to certification, including fellowships that allow them to license while working. Accountants without a CPA can work in many settings, e.g. bookkeeping, analyzing budgets and costs, etc. Healthcare professionals can consider non-regulated occupations such as medical interpretation or positions in administration, research or community health. 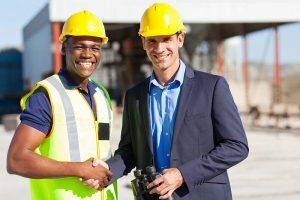 Non-licensed engineers or architects can work in technical, advisory and management positions that can have an important impact on engineering projects. Local Technical Colleges can team up to create Certification Programs as an alternative as well. For example, our local Techical College started a free Certified Production Technician Program. After completing a 12 week course, graduates are guaranteed an interview at an employer in their desired field, which can lead to a significant job upgrade. This is a brand new program. Hopefully by April, we will have good news with some folks who found a great job! But before you give up and resort to reckless consumption of eggnog or chocolate, let me offer another perspective: December and January may be the best time in the year to begin cultivating strategic relationships with brand new employers that will benefit your clients in the long term. Yes, some people will be on vacation, but with less hiring going on, employers probably actually have time to talk to you! Believe me, it is worth it to brave the cold and get out there for some meetings. The effort that you put in now will have a direct influence on which employers are calling you several months from now- If you want to have a good March, June, or September make it a good December. As you think about which employers to target, consider prioritizing employers that have a strong record of providing in-house training programs that help employees “climb the ladder” within the organization. Last month at Higher’s Second Annual Refugee Employment Workshop, Dr. Faith Nibbs of the Forced Migration Upward Mobility Project (FMUMP) shared that refugees who found long term career success often did so through these types of training programs. A great place to start identifying companies that provide training is Training Magazine’s annual “Top 125” list of organizations that excel at employee development. 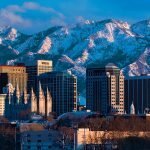 While some companies may be out of reach for your clients, there are many on the list that offer realistic career entry points including Jiffy Lube, Dollar General, Walgreens, ConAgra Foods, McDonalds, Choice Hotels International, MGM Resorts International, PetSmart, and Enterprise Rent A Car. For a wonderful example of this kind of career laddering check out this video story from FMUMP about an Ethiopian refugee who has opened more than 20 Domino’s Pizza franchises! 15 Great Jobs. No College Degree Required. 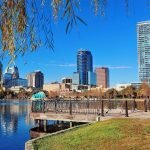 All 15 jobs on a recent list from careercast.com offer a living wage and are in projected growth industries. None require advanced degrees and many emphasize hands-on skills and experience that are often in-line with what our clients bring to the U.S. workforce. Several are in the medical field, including dental hygienist and medical records technician. One that isn’t on the list but should be, according to Susan Adams in a related article at Forbes.com is Radiology Technician. Others are administrative (paralegal, bookkeeper) and construction-related (carpenter, electrician). Appliance Repairer is also included. According to a successful job seeker who now runs a company that hires others and was interviewed by Adams for her article, “you don’t walk out of university being job ready.” On-the-job skills, rather than university degrees, helped him land the job that eventually led to his success. He looks for similar real life experience in new hires. The information included in the two referenced articles will give you new ideas for job development and deeper understanding of the requirements and earning potential offered in 15 occupations that will offer clients strong career growth potential. Employee referrals can be a double edged sword for employment professionals. When you suddenly get cut out of a great placement pipeline because the employer gets so many referrals and direct applicants from the refugee community, it can feel frustrating, right? Instead, acknowledge this as a strong indicator that you’re doing your job well. Our clients are amazingly supportive of each other. Most actively seek ways to give back to their communities and the refugees who follow their resettlement footsteps. We want to build refugee skills that support this generous spirit, increase independence and build long term self-sufficiency. There’s no better proof that what we do is successful than a client who utilized their own network to find a job. Employee referrals are widely acknowledged by employers as the strongest source of new hires. Employees who make and apply through internal referrals stay longer, learn their jobs faster and are hired more quickly and cheaply. Click here to read more research and analysis about internal referrals. Add questions about internal referral incentives to your standard job development research. Know which employers offer financial incentives for employee referrals. It’s an indication of a worker-friendly corporate culture. Educate clients about the benefits – and responsibilities – that go along with internal referrals. If too many of their referrals don’t work out, the employer might stop hiring refugees. Don’t ditch employers who are relying on employee referrals. Continuing to offer supportive services can open new opportunities and prevent problems from sabotaging a beneficial relationship. Reach out to successful former clients to request their help in referring others for job openings. That’s a win-win that could net a new or expanded employer relationship. When Serving Skilled Immigrants, You Don’t Need to Re-invent the Wheel! Check out the organizations and initiatives below! 1. Upwardly Global – Upwardly Global (UpGlo) provides customized training and support for skilled immigrants and connects them to employer partners interested in hiring global talent. In addition to it’s 5 brick and mortar locations (New York City, San Francisco, Chicago, Detroit, and Silver Spring, MD) UpGlo offers online training programs for skilled immigrants who live elsewhere in the US. For more information about UpGlo’s online training options, click here to register to attend a webinar they’re offering just for us on July 28. 2. Imprint Project – The IMPRINT Project is a coalition of organizations active in the emerging field of immigrant professional integration. Imprint works closely with business, government, higher education and other partners to raise awareness about the talents and contributions of immigrant professionals. In addition to the services that member organizations provide, IMPRINT provides a wealth of resources on its’ website including publications, program resources, articles and op-eds and webinars. 3. Global Talent Bridge – An initiative of World Education Services, Global Talent Bridge is dedicated to helping skilled immigrants fully utilize their talents and education in the United States. Global Talent Bridge’s services include support, training, and resources for community organizations, government agencies and employers; direct outreach to skilled immigrants, including seminars and comprehensive online resources; and policy advocacy at the local, state and national level. To get started, check out their Resources for Immigrants page. 4. Welcome Back Initiative – The Welcome Back Initiative focuses on internationally trained health workers living in the United States. They do this primarily through their network of “Welcome Back Centers” which provide orientation, counseling and support to foreign-trained health workers. Welcome Back Centers currently exist in California, Massachusetts, Rhode Island, Washington state, Maryland, New York, Texas, Colorado, and Pennsylvania. 5. Community College Consortium for Immigrant Education (CCCIE) – In addition to the professional experience and education immigrants bring with them, many also pursue education here in the US. Classes at a community college are often the first step. CCCIE’s mission is to raise awareness of the important role community colleges play in delivering educational opportunities to immigrants and to promote and expand the range and quality of programs and services for immigrant students among community colleges around the country. For an orientation to this organization and what they do, check out their presentation Immigrant Students and Workforce Development. In addition to the great resources listed above, don’t forget about mainstream workforce development programs/resources in your region that may provide the extra boost that a skilled immigrant needs to break into a professional job. Use the search feature on Higher’s website to find useful information about WIOA opportunities and more resources to support skilled immigrants. Daniel Wilkinson is a Philadelphia-based job developer with nearly 5 years experience serving refugee communities. He has worked for Lutheran Social Ministries of New Jersey in Trenton, NJ and Nationalities Service Center in Philadelphia, PA.
Everyone should already be aware of Upwardly Global programs and resources. 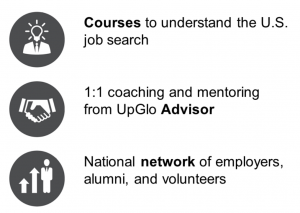 UpGlo exists to help highly skilled professional refugees and other immigrants achieve career success and contribute their motivation, training and expertise to U.S. economic growth. Here are three ways to make sure you are making full use of UpGlo resources to better serve refugee professionals. 1. Register to attend an UpGlo webinar. Include your clients, too! Attend a one hour UpGlo webinar on July 28, offered especially for the refugee employment network. You’ll learn about eligibility criteria and program services available nationally. There will be plenty of time for questions, too. Your highly skilled refugee clients would benefit from attending themselves. The information is substantive and accessible for high-intermediate levels of English language proficiency. 2. Help medical professionals explore career options in their fields. Learn more about another excellent FREE web-based resource presenting alternative career pathways for doctors, nurses, pharmacists and dentists in a previous Higher blog post. Watch the Youtube video in this post, which shares the impact of UpGlo’s model in the voices of immigrant professionals and volunteer career mentors who have participated and benefitted. If you’re trying to establish an employer partnership or employment mentor program with a hospital or care facility, sharing this video would strengthen your pitch! 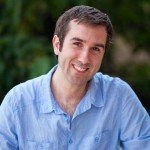 A list of 43 free on-line courses all offered by reputable sources (e.g. Stanford and MIT) caught my eye as a resource for highly skilled clients. Often, our clients crave educational credentials. These courses don’t build credits toward a degree, but employers value fresh skills. Learning something new demonstrates initiative, motivation and follow-through, all of which are marketable “soft” workplace skills. For our clients, topping an unconventional resume with U.S.-based experience or training can make a big difference. On closer inspection, they might be useful for you, too. Click here for the list. Although Lynda.com isn’t one of the providers on the list, that’s another great source of high-quality courses. It’s free for a month trial, then offered at a reasonable monthly fee you can cancel whenever you’re finished.